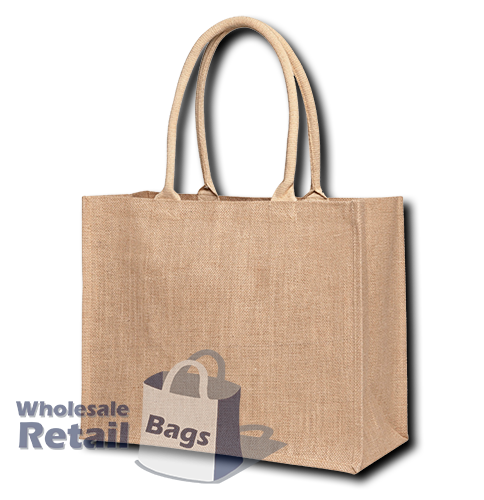 The fashion jute bag is the most popular bag in our jute lineup. The inside has a plastic laminate to help delicate items like garments, while the outside is natural coarse jute fibre. Sewn side seams and a rope handle make this a very smart looking bag, and the landscape layout helps make the bag extremely popular in the fashion industry. The next step up from the fashion jute bag is the contrast jute bag, the dimensions are approximately the same but the contrast jute features a coloured gusset. We also carry the fashion juco bag, which again is similar dimensions but is made from Juco instead of Jute. Juco is a blend of jute and cotton, giving the final product a softer finish.